The Chinese clearly knew a thing or two and there is evidence of paper used for wrapping (hemp wrapping paper from about 100 BC on the right) and padding from the 2nd century BC. Finishing it so that it could be used for writing had to wait until the third century AD, but by the sixth century AD, toilet paper was also being produced. 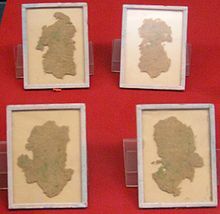 And to show that there is nothing new, folded and sewn paper enclosing tea (yes, tea bags) were being used in China from the seventh to the tenth centuries. The knowledge and skills of paper making spread across the Far and Near East and Europe and the first reference to a papermill in Britain was that belonging to John Tate near Hertford, and a book printed by Wynken de Worde in about 1495 used this paper. Sir John Speilman owned an early papermill at Dartford in Kent, and other papermills were then established through the country. The first sheets of paper were made on molds constructed of thinner horizontal wires, with thicker vertical wires for support (see right). The impressions of these wires appeared on the sheets of paper, and are called ‘laid lines’, and paper with this appearance, laid paper. As you know if you have tried to print on laid paper yourself, the surface is not good for that, as the ink is hard to impress on the ‘valleys’ between the laid lines. 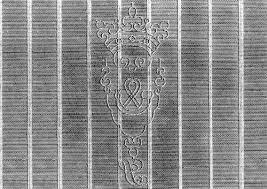 Watermarks are added by twisting a wire design through the laid wires, and this is then impressed on the sheets of paper. 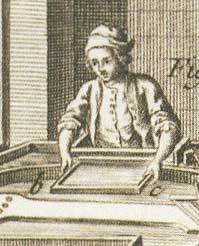 Paper with a smooth surface was first made by a man from Kent – James Whatman (1702–59). 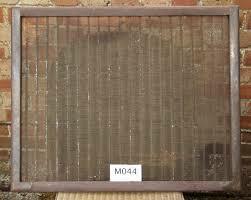 The paper surface was called wove because the mesh supporting the paper was woven, and not made of parallel wires. Wove paper is called Vélin in Europe. 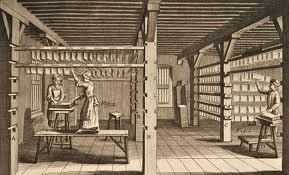 In 1757 John Baskerville printed his edition of ‘Virgil’ on wove paper produced by Whatman. It took only a couple of decades for this new paper surface to spread to other mills in the UK and abroad. The essence of paper is fibres, these can be from wood, as used for most of our paper, such as magazines and newspapers, or from cotton or linen rag; paper from these last two sources is usually of finer quality, such as writing paper, paper for fine prints, and also paper for calligraphers. 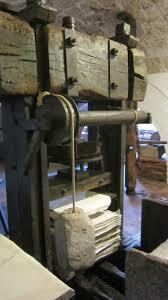 The source material is pulped, originally with a large wooden hammer (stamping mills), and mixed with water to do so. The vatman, as on the right, then dips a mold and deckle into this vat of fibres and water and moves the mold and deckle this way and that to ensure an even coating of pulp all over the mold. The mold and deckle are then usually rested on the edge of the vat to allow some of the water to drain away. 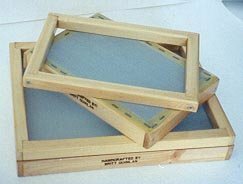 The mold consists of a stout rectangular or square (or sometimes even circular) wooden frame over which is stretched a mesh. The deckle sits on top of the mold, usually with a slight indentation so that it fits securely all round. 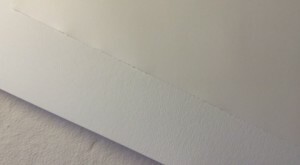 Despite this tight fit, though, very often some of the paper fibres seep out between the mold and deckle, and this creates the characteristic deckle-edge of hand-made paper. You can get deckle-edged paper that is not hand-made, but then this edge is artificially constructed in the paper making process. The couchman (pronounced coochman, and on the right in this print) then takes the mold and deckle, removes the deckle, and skilfully inverts the mold on to a piece of thick felt. Insodoing the paper fibres, now in a sheet, lay squarely on the felt support. The mold and deckle are returned to the vatman, and the couchman lays another piece of felt on top ready for the next sheet of paper. These create quite a high stack of paper sheets and felts. Pressure is added, usually in a small press with an enormous screw, to encourage the water to drain away. The sheets of paper are then laid on ropes in vast rooms to dry completely. But this is not the end of the paper-making process. Two additions are needed. First, the paper is finished. If the paper is left as it is with no treatment at all, then the surface is called rough (see bottom left in the picture). If the sheets of paper are passed through hot rollers, rather like a hot iron, then the surface is called hot press (hot pressed – as in top right). If the sheets of paper are passed through cold rollers, then in the UK this is called not (see middle section) because it is not passed through hot rollers! In the US they’re not quite so romantic and the paper is called cold press (cold pressed) because that is how it has been finished. Then the paper surface needs to be sized if it is to be used for writing or printing, othewise wet ink spreads and bleeds into the paper fibres and looks like tiny spiders (blotting paper isn’t sized). This was done first using animal gelatine. 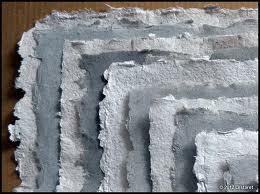 Nowadays, many paper makers add size to the vat of paper pulp, and the paper is then called tub sized. This is useful for calligraphers because if an error needs to be removed and with it some of the paper surface, the size is throughout the paper and not just on the surface, and so the error can be written over. Changes were afoot though and bleaching paper, the ‘Hollander’ machine which enabled more than just cotton rags to produce fibres (they then were able to add old ropes and fishing nets as well! 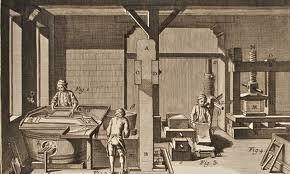 ), size from aluminium sulphate and the mechanisation of paper making all meant that the slow, laborious, but very skilled ways of making paper by hand were gradually, but not completely, replaced. Most paper now is made using the Fourdrinier process (see right). In this the whole paper making process is speeded up and done in one continuous process. 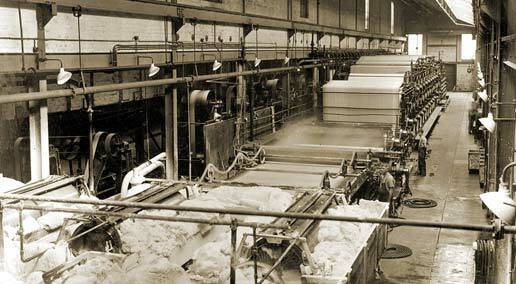 Paper fibres are produced from the source material with size added to the vat, the paper pulp is then allowed to fall on to a conveyor belt, the water drained and sucked out, huge paper sheet pressed, and then the massive rolls of paper finally dried, and finished. 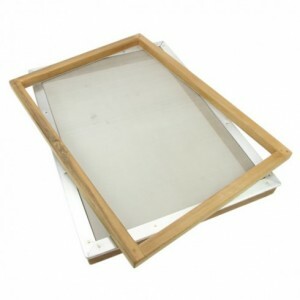 Paper for printing is often coated as well so that the printing ink stays on the surface. The process of joggling the paper pulp along the conveyor belt while these various processes were going on resulted in the long paper fibres settling in the same direction – hence the problem of tearing clippings from newspapers and magazines! This entry was posted in Blog, Calligraphy and lettering, Interesting stuff and tagged couchman, grain direction, hand-made paper, making paper, paper, vatman on 18 February 2014 by Patricia.